25-Mar-2006 -- The next morning I rose very early, loaded all my equipment in the car and left the hotel at 7:00 a.m. before the time had come when they would open the breakfast buffet. Waiting for breakfast at the hotel would have cost me too much time, as I knew that my plans for today were ambitious. When I drove out of Side, the snow-covered Western Taurus Mountains (Batı Toroslar) north of the coastal plain offered an impressive sight in the light of the rising sun, the haze that obstructed the sight yesterday had vanished over night. I drove along the coastal road back to Antalya, the way that I had already driven yesterday in the opposite direction, when I had visited 37N 31E. In Antalya I looked for traffic signs to guide me in the direction of Burdur, this worked very well, and soon I left the city north towards Bucak and Burdur. After a while I stopped beside the road and had a light breakfast consisting of some bread that I had over from the flight meal yesterday, and the tomatoes that I had received as a present at 37N 31E. The road went over some mountain passes, crossed wide plains, and descended down towards Burdur Gölü, a large lake. 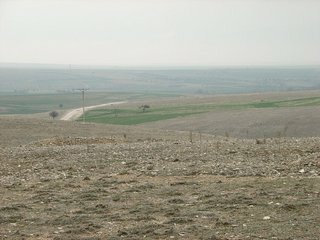 Winding around its northern part, it continued on towards Dinar, but before reaching the town I turned off on another road in direction Denizli. Only about 15 km later, the arrow on the GPS receiver began to turn to the left, and then I saw a road sign pointing towards Körkuyu ("Dried out well"), the village closest to 38N 30E, my first aim for today. A smaller road ran through farmed land and brought me to the village, the Confluence was now less than a kilometre ahead. I passed through the village without raising much interest (at least this was my impression). The small road continued further and 200 m south of the village I passed the closest approach to the Confluence, which was about 540 m to the right over a barren hill. I continued a little farther on the road to see whether there was a closer or better approach still to come, but this was not the case, and I returned again to the point of closest approach. It had taken me 4 hours time and 270 km driving from my hotel in Side to get here. I took all my gear and started walking the remaining distance towards the point, which meant I had to climb this barren hill. All the region around was farmed, but here on this stony hill only small herbs grew and no signs of agriculture could be noticed. I arrived at the Confluence 20 minutes later, the sky was overcast and a chill wind was blowing. The GPS receiver indicated an EPE of 4 m and an altitude of 989 m. I took the usual photos and when I was trying to shoot a last picture of myself, I noticed two men with a dog coming towards me out of the direction where I had left the car. I quickly gathered all my equipment, and when they arrived they immediately started to interrogate in a not too friendly manner. They insisted on having presented papers, and to not stall the situation I accompanied them back to my car in the hope to explain things better to them there. I showed them the map and the lines on it but I cannot say for sure whether they understood anything of what I tried to explain to them. On the other hand, I understood partly what they tried to explain to me: The village people could become troubled by an unknown car passing their village and by someone stalking around and over the hills near their village, and they could possibly call for the Jandarma. Obviously the two wanted to play the role of some self-appointed "village guardians". After a while they went back to the village, still in a very surly mood, and me too, I left the location and drove back in direction Dinar. This was a rather dampening event right at the start of my projected confluencing tour, I hoped that I would not have to meet such unfriendly people again, moreover as this kind of hostility is absolutely untypical for Turkey and its people. But I did not give too much thoughts about it and put my minds ahead and towards my next aim for today, 38N 31E.